Given the recent tragedy at Garissa University in Kenya and the ensuing threat of terrorist activity in the nation, Indiana University is temporarily transitioning learners from the AMPATH program. IU School of Medicine has been in close communication with AMPATH leadership and other partnering organizations related to this transition. The initial focus in response to the decision was to communicate to those currently in Kenya and to support their return travel arrangements. Once those currently serving in Kenya were informed, attention turned to informing others who have plans for -- or have been considering -- service in Kenya. Leaders from Indiana University and IU School of Medicine will closely follow the situation in Kenya to determine the best time for learners to return to the program. The “power of pink” returns to downtown Indianapolis and the IUPUI campus April 18 for the 24th annual Susan G. Komen Race for the Cure, as thousands of runners, walkers, family members and others join IUPUI's effort in the annual spring battle against breast cancer. Many will wear the color pink -- hats, shirts, wigs, flags, banners, placards and more -- to honor those who have fought or are still fighting the disease. Through the years, Komen Central Indiana Race for the Cure has raised $17 million for the mission. The event is based in Military Park next to the IUPUI campus and will wind through portions of downtown Indianapolis. Registration begins at 7 a.m. and the event runs through 11:30 a.m. The schedule includes opening ceremonies, the annual Pink Parade of breast cancer survivors, a 5k competitive run and a non-competitive run/walk, a one-mile family walk, a Kids’ Dash, food trucks and a sponsor expo. Parking is free on IUPUI surface parking lots only, and is limited. Those who arrive early (before 6:30 a.m. is recommended) will have the best chance of parking near the event. An event celebrating the leadership of Charles R. Bantz, IUPUI chancellor and executive vice president, Indiana University, will be held from 4 to 6 p.m. Tuesday, June 2, in the IUPUI Campus Center, Room 450. Remarks will begin at 5 p.m.
Bantz, who has guided IUPUI through a period of growth and unprecedented student success for more than a decade, will step down as chancellor in August. To kick off Melanoma/Skin Cancer Detection and Prevention Month, the IU School of Medicine Department of Dermatology will conduct free skin cancer screenings from 7 to 9 a.m. Monday, May 4. The screenings, available by appointment only, will be held at IU Health University Hospital, Eskenazi Dermatology Clinic and Coleman Hall. Call 317-916-3525 to schedule an appointment. The event is co-sponsored by the American Academy of Dermatology. Individual laboratories may submit multiple abstracts; if space becomes limited, each laboratory will be asked to identify representative posters. All abstracts must be submitted by 5 p.m. Friday, April 24. Complete the application and abstract template. Electronic medical record systems and computerized physician order entry systems provide clinicians with decision support in the form of warnings or reminders about possible drug interactions, recommended immunizations, need for specific follow-up and other information important and potentially critical to patient care. To date, most clinicians must go through a lengthy process to get specific warnings or reminders added to the electronic medical record. But what if electronic medical users could conveniently write decision support rules based on personal experience with the patients they serve? That’s possible now with RAVE, a powerful new distributed approach to clinician decision support rule authoring "personalized" to patient population, location and time, developed by the Regenstrief Institute and tested at Eskenazi Health, one of the nation's largest safety net hospital systems. RAVE, short for Rule Authoring and Validation Environment, will be presented by Titus Schleyer, DMD, Ph.D., director of the Regenstrief Institute's Center for Biomedical Informatics and the Clem McDonald Professor of Biomedical Informatics at IU School of Medicine, and Lisa Harris, M.D., CEO of Eskenazi Health, associate dean for Eskenazi Health Affairs at the IU School of Medicine and a Regenstrief Institute affiliated scientist, in an e-presentation at the 2015 Healthcare Information and Management Systems Society's Conference and Exhibition from April 12 to 16. The IU School of Medicine Spring Faculty Meeting will be from 4:30 to 6 p.m. Tuesday, May 5, in Walther Hall Auditorium, R3 203. Dean’s update – Jay Hess, M.D., Ph.D.
2015 faculty election results and award recipients’ recognition. LCME update – Peter Nalin, M.D., IUSM executive associate dean for education, with input from Dan Hunt, M.D., M.B.A., co-secretariat, LCME. Faculty members are encouraged to attend in person; however, the meeting will be available via live web stream. Instructions for viewing are posted on the Faculty Steering Committee Web page. IU School of Medicine students have until 11:59 p.m. Thursday, April 16, to complete the questionnaire about the medical student experience. The survey is required for reaccreditation by the Liaison Committee on Medical Education. The LCME requires a high response rate from students at each school undergoing the reaccreditation process. The IUSM Report Card team set a goal of 90 percent participation, and it looks like they may exceed the goal. As of April 13, the total response rate for the entire student body was 89.9 percent. Response rates for all campuses are over 85 percent. All but one campus surpassed 90 percent, and two campuses (Lafayette and Terre Haute) had 100 percent response rates across all four years. 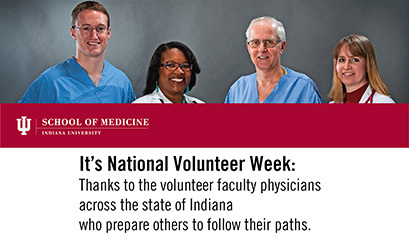 "Great thanks are due to Zach Walker (Lafayette) and Amy Richmond (Terre Haute) and the staff at their respective campuses for achieving those numbers," co-leaders Janice Farlow, M.D., Ph.D. candidate; Ben Ulrich, MS2, and Dessi Moneva, MS3 and Medical Student Council president, said. 100 percent of Indianapolis MS1s completed the survey. For more information, visit the IUSM "Road to Accreditation" website. David Chrobak, MS3, IUSM-South Bend, received the John H. Edwards Fellowship. The fellowship honors an IU graduate student who demonstrates good citizenship, character and outstanding scholastic ability. Dedication to service also is a consideration. Recipients of the Edwards Fellowship are identified by a committee of university representatives among candidates in its graduate, medicine, law and business programs. It includes a $20,000 award. A search committee has been formed to identify candidates for the position of Indiana University vice president for research. Bernice Pescosolido, Distinguished Professor of Sociology in the College of Arts and Sciences at IU Bloomington, and David B. Burr, associate vice chancellor for research at IUPUI, will co-chair the 18-member committee. The group includes faculty, administrators and students representing IU’s Bloomington, Indianapolis and regional campuses. The new vice president will succeed Jorge José, who will step down when his five-year appointment ends July 31, 2015. José will serve as Rudy Professor of Physics at IU Bloomington and a member of the Department of Cellular and Integrative Physiology at the IU School of Medicine. 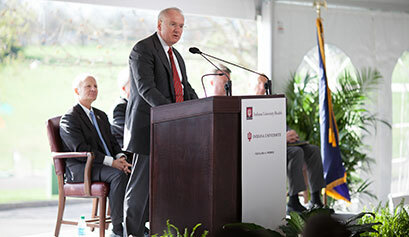 "I am grateful that Professor Pescosolido, Associate Vice Chancellor Burr and the other members have agreed to undertake this search, which is essential to the university’s future success as a research institution," IU President Michael A. McRobbie said. "Vice President José has set a high bar with his hard work and leadership. I am very pleased that he will continue to contribute to IU’s success with his own important research on neuroscience and neurological disorders." To build on the success achieved by José, the committee will conduct an internal search within Indiana University. It will make its recommendations to McRobbie. The university hopes to have a new vice president identified by the time José steps down. The internal deadline for applications for the National Institutes of Health Ruth L. Kirschstein National Research Service Award Institutional Predoctoral Training Program in the Neurosciences is Wednesday, April 22. The goal of the NIH NRSA program is to help ensure that a diverse pool of highly trained scientists is available in appropriate scientific disciplines to address the nation’s biomedical, behavioral, and clinical research needs. In order to accomplish this goal, NRSA training programs are designed to train individuals to conduct research and to prepare for research careers. This jointly sponsored funding opportunity is designed to support outstanding neuroscience programs that will provide students with the skills and knowledge necessary for successful pursuit of careers as independent scientists. Application guidelines for the Kirschstein NRSA predoctoral training program and more information are available. As part of its national project to advance cancer research nationwide, Phi Beta Psi Sorority provides research grants to qualified investigators addressing original questions and hypotheses to be explored in basic and clinical studies in the field of cancer. Research applications must be focused on brain, breast, colorectal, endometrial, lung, ovarian, pancreatic or prostate cancer. The internal application deadline is Friday, April 24. More information and submission guidelines for the Phi Beta Psi Sorority cancer research grants are available. Predoctoral students wishing to pursue careers in cancer research may apply for the Translational Cancer Biology Training Program. The program is designed to enhance training received in any individual laboratory or department. Trainees are exposed to a broad range of cancer-related research encompassing both basic and clinical aspects of the disease. Students in the program fulfill the requirements of their individual basic science departments and complete the cancer biology minor. Predoctoral CBTP trainees attend both a basic science and a clinical seminar series co-sponsored by the IU Simon Cancer Center and participate in the monthly meeting of trainees and in the IU Simon Cancer Center's annual Cancer Research Day. The application for the Translational Cancer Biology Training Program is available. Application deadline is May 22. John I. Nurnberger, Jr., M.D., Joyce and Iver Small Professor of Psychiatry and chair of research for the IUSM Department of Psychiatry, was honored April 10 as one of Indiana University's new distinguished professors at the 2015 Celebration of Distinguished Teaching dinner. Dr. Nurnberger was one of six IU researchers and scholars promoted to distinguished professor, the most prestigious academic appointment IU can bestow upon its faculty. Aaron Kalinowski, M.D., assistant professor of clinical medicine and of clinical family medicine at the IU School of Medicine, recently received the prestigious Achievement in Medicine Award presented by St. Margaret's Hospital Guild and the Indiana Blood Center. Dr. Kalinowski, chief physician executive at Eskenazi Health Pedigo, was nominated for his work to help connect homeless men and women with integrated and comprehensive mental health and primary care services. He helped establish Eskenazi Health Pedigo at Horizon House, a health center that brings both mental health and primary care services together at a day center that serves the homeless.